Police and masked rioters clashed on Jerusalem’s Temple Mount Wednesday morning, as tensions ramped up ahead of the Jewish holiday of Sukkot. Rioters were chased by police into the al-Aqsa Mosque, located on the Mount’s esplanade, after fighting broke out following the opening of a gate for non-Muslim visitors. Protesters inside the mosque tried to spray flammable liquid out of windows toward officers. They also threw Molotov cocktails from within the mosque for the first time, according to Israel Radio. Four policemen were wounded in the clashes, and 15 arrests were made, according to police. 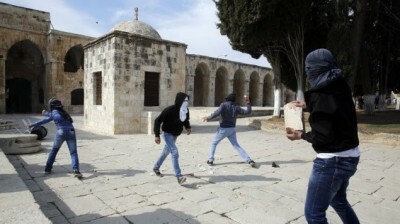 The Palestinian Ma’an news agency reported dozens of Palestinians were injured in the clashes.